If you don’t know who this young talent is, especially after today, you probably will soon enough. 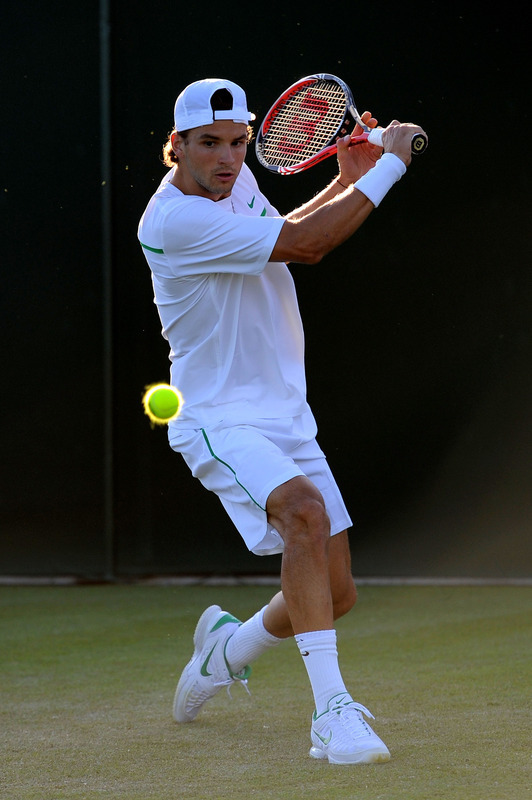 His name is Grigor Dimitrov, a 20 year old from Bulgaria with a strikingly similar game to Roger’s. Smooth game, one handed backhand with massive whip, an uncanny ability for shot making, and his forehand is good too. He was the junior champion at Wimbledon in 2008 (like Federer in 1998), and today he took on established Frenchman, Jo-Wilfried Tsonga in the second round on Court 1. The two slugged it out (Tsonga prevailing 6-7 (4) 6-4 6-4 7-6 (8)) hitting an array of shots with power, spin, and depth. They hit passing shots, diving volleys, and just all sorts of winners. Stop me if this sounds a lot like the talk of Federer being the next big thing, about 10 years ago around this time of year, when he beat Sampras in a match that will forever be remembered. Surely all the finest details would be compared today had he converted few opportunities to clinch the fourth set and pull out the win in the fifth set (all court game, one-handed backhand, variety and intuition,..even down to the 90 square inch Wilson racquet and being Nike sponsored for clothing). He has pushed Rafa to three sets previously at Rotterdam in 2009, and played a few other top 10 players pretty tough but so far has not gotten that big win over a big-name player. I have to put this in: I was rooting loudly at the television for him to defeat Tsonga. Seeing a player that isn’t hitting very loopy or very flat (trying to crush every ball) consistently (Richard Gasquet, Mikhail Youzhny, James Blake) who displays a overall very sound game like Dimitrov is refreshing. It shows his versatility, grace, and a new spin on tennis as he is part of the new pool of players trying to make their name at the top of the men’s game. Just me, I would like to see it, but unlike in 2001 when Federer defeated Sampras, I think Roger will win in a match vs this so called “baby Fed,” “the next Federer.” Roger at 29 is just much different from Pete at the same age when it comes to level of play respective to age, motivation, dedication, persistence, and love for the sport.